RFID and qr code are alternative technologies of one-dimensional code. the qr code and RFID authentication link are key links of the Internet of things. Although the concept of the Internet of things is very big, if the relevant supporting policies of the 'Internet of things' are officially determined, the qr code and RFID will be the earliest beneficiaries of the Internet of things investment." "Professor song haitao believes that in this context, the competition between the two technological routes will become increasingly fierce. In the alternation between the two technologies,Rakinda believes that each has its own advantages, RD006 and RD007 barcode and RFID scanner, perfectly solving the application integration of access control. Wal-mart, a giant retailer, has invested heavily in RFID technology, but has not made much progress in the past few years.The cost is the main promotion bottleneck. "The initial cost of RFID is at least ten times more expensive than a qr code, which has always been a big hurdle for a low-margin industry like daily chemical retail." "But rfid also has the advantage that qr codes cannot be realized, that traditional qr code labels cannot be modified after printing, that RFID can read and write multiple times, and that the storage capacity is greater. "Interview, most experts and users agree that in the future two technologies will co-exist for a long time, cannot replace each other, qr code in the retail cosmetic manufacture low-margin industries development faster, but in traffic management, logistics luggage packages, containers, container, vehicle management, medicine and food safety management, personnel in the ticket application documents and can be repeated use, RFID will have more advantages. However, the reporter learned in the interview that there are already some manufacturers of qr code through the back-end service mode, which has solved the two bottlenecks of not being able to modify the qr code many times and insufficient capacity, which undoubtedly increases the leverage of the competition between qr code and RFID. 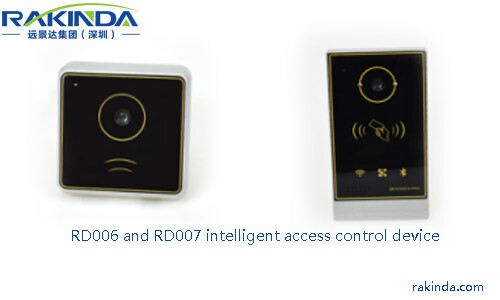 RD006 and RD007 intelligent access control device is good for you.